As a huge movie buff, I am probably spending more time than I should on Netflix (I am sure, I am not the only one here). 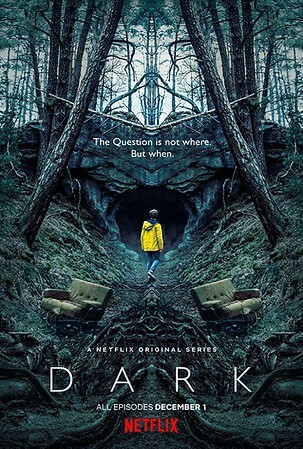 So when I saw Netflix' announcement of their new show called "Dark", I was very excited. Apparently, the show is about two children disappearing in a small german town and it is supposed to be quite scary. People already call it the german Stranger Things. Well, this is not why I was excited. I never made it past the first Stranger Things episode and I am not a big fan of scary stuff. What really caught my eye was the amazing poster artwork. After seeing the poster, I am pretty sure you know why I like it. With the mirroring technique, a surreal world and a strong mystery mood are created. Much like in my own pictures. Additionally, the creator masterfully uses mirroring to evoke emotions and to lead the viewer's eye. Everything leads to the boy who is exactly in the center of the picture. Additionally, the only strong color is his yellow jacket. You cannot help but focus all your attention on the boy. Even more intriguing: You can only see his back as he is slowly walking towards a dark cave. Anybody wants to scream: "Don't go in there!"? But as you look around you notice further elements adding to the scary mood. The boy has just passed two trees. Almost like a first gate. What amplifies this effect, is that the trees are inclined towards each other. This gives the whole picture a certain kind of movement, almost as if the trees were collapsing and thus blocking the boy's way back. Have you noticed what's above the cave? There is a structure in the rock that looks like a set of eyes. This makes the cave the mouth of an evil creature about to devour the unlucky kid. Even creepier are the roots in the bottom center. Again there is some movement in the picture, the roots look as if they were growing towards the boy, slightly pushing him down the (rabbit's) hole. There is one thing I don't like, though. The two couches are unnecessary. I understand that the artist wanted to fill the void there, but they look like added later and really only distract the viewer. All in all, the image composition creates a very scary situation and adds a lot of dynamic. Truly a masterful composition. Unfortunately, I couldn't find out who created this picture. I would really like to discuss it further with him or her! What do you think about this picture? Comment here.